I can't believe Halloween is already behind us and right around the corner is yet another holiday! Phew.... I can't seem to get caught up this year! 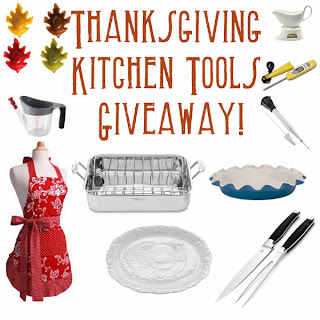 So before another month flies right by I have an amazing Thanksgiving Kitchen Tools giveaway to jump start November! So whether you are hosting a Thanksgiving dinner or are just in need of adding some fun kitchen tools and gadgets to your kitchen tool you will want to enter this giveaway! This year, I am hosting Thanksgiving dinner for my family so I need to start planning the menu and well start decorating! Right now that means I need to start taking down the cob webs, skeletons, and pumpkins that are hanging around my house! I swear I just put up all the Halloween decorations and now it's time to take them down and pack them away until next year. So what are you waiting for..... go and enter for your chance to win! 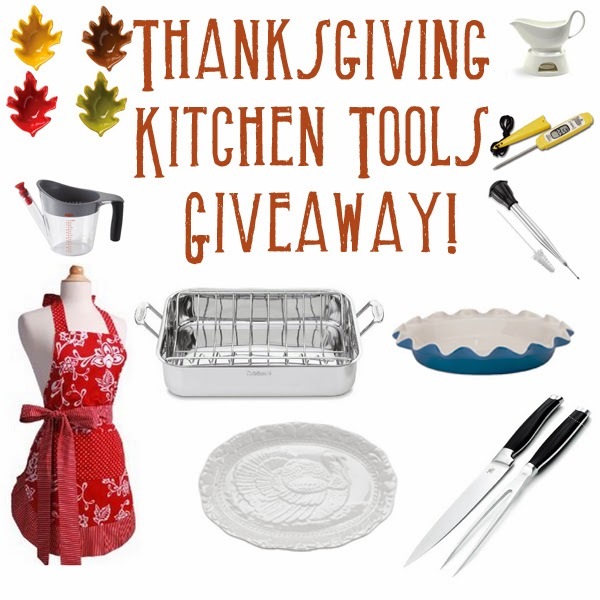 Welcome to the Thanksgiving Kitchen Tools Giveaway! One lucky reader will win a bucket load of Thanksgiving kitchen tools. Rules: Use the Rafflecopter form to enter daily. Besides the mandatory email address entry,, all other entries are optional. Holly’s Helpings is responsible for prize fulfillment. Giveaway ends 11/21 at midnight PST and is open to the US.